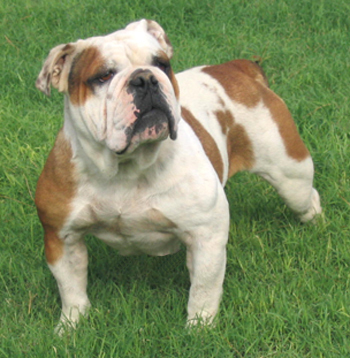 The following dogs played an important part in the development of the Rio Bravo line of Olde English Bulldogges. 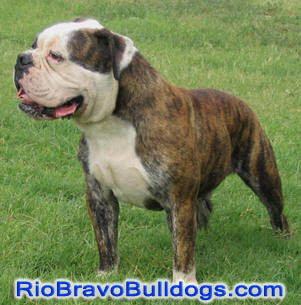 The Rio Bravo Bulldogge line was established for the most part in early 1992, however we began our journey in the bulldog world much earlier. 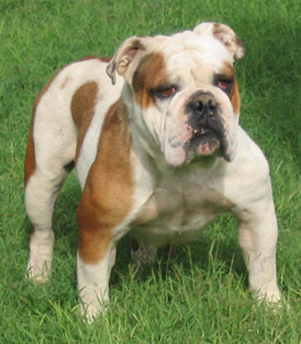 We began competing in the conformation show ring, obedience training and breeding various bully breeds in 1987 with the United Kennel Club and finished a couple of champions. 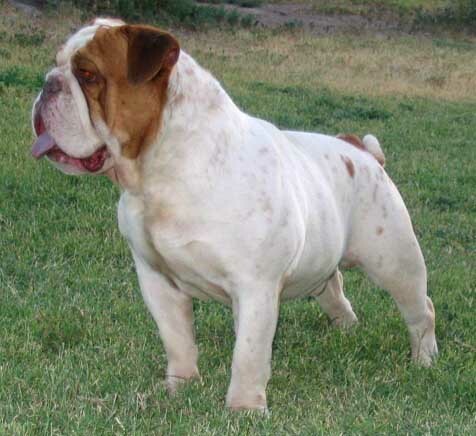 We now judge in both the International Olde English Bulldogge Association and the United Canine Association. 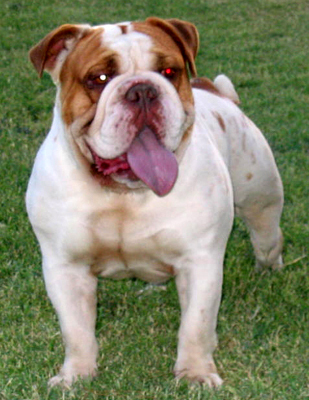 Deuce continues to play an important part in the development of the Rio Bravo line of Olde English Bulldogges. 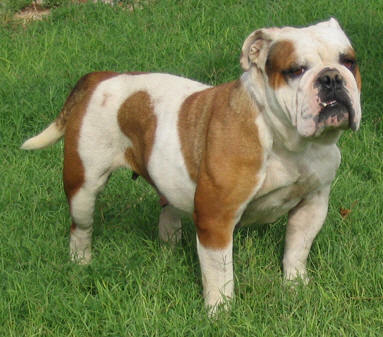 We currently have Deuces Wild genetics in several females and males that we use in our breeding program. Rio Bravo's Ima Deuce Z, Rio Bravo's Shes A Deuce Z and Rio Bravo's Tule Pride are all direct daughters of Deuces Wild. Deuce added mass and bulliness to our line. Stampede was a son of our Rio Bravo's Bam Bam (not Legacy's Bam Bam). 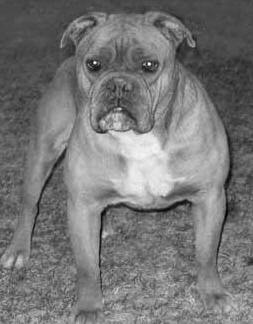 Stamp was the father to Rio Bravo's Chief Mojave. Chief Mojave is a son of our famous Rio Bravo's Stampede and Rio Bravo's Pheobe. Chief is the father to Rio Bravo's Oildale Janie and Rio Bravo's Kall Me Katy. 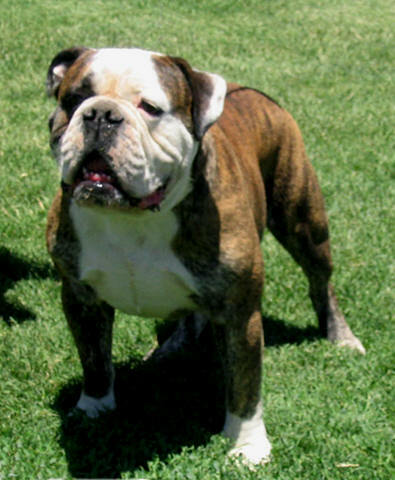 He is the grandfather to several other Olde English Bulldogges including our Rio Bravo's Strawberry Wine, Rio Bravo's Peaches and Cream and Rio Bravo's Bubbalicious and others. We want to thank our good friends at Joyful Acres for the use of Trinity. 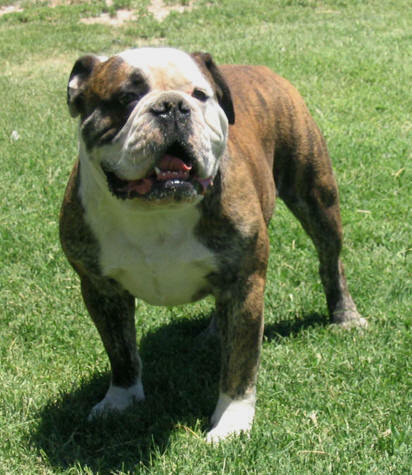 Trinity is the father to several of our current Olde English Bulldogges such as Rio Bravo's Strawberry Wine, Rio Bravo's Peaches and Cream, Rio Bravo's Bubbalicious and Rio Bravo's Jolene Jolene and others and will soon to be a grandfather. Pheobe was an important part of the development of our bloodline. 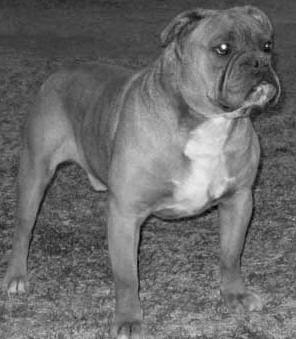 Pheobe was a line bred SBK line female. She was a niece to our Big Gus and an inbred daughter of SBK's They Call Me Stud. 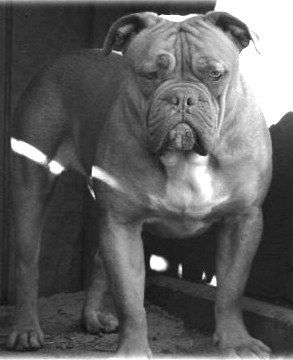 That made her a line bred granddaughter of SBK's King of The Hill aka BTK's Nero The Hero. 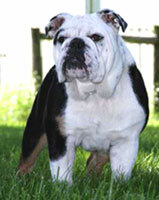 Pheobe is the mother and grandmother to several of our Olde English Bulldogges. 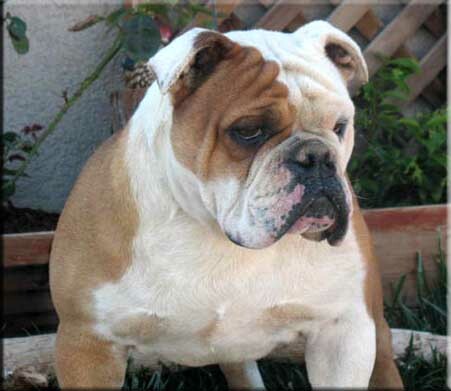 Legacy's Bam Bam was often referred to as the "Legendary Bam Bam". 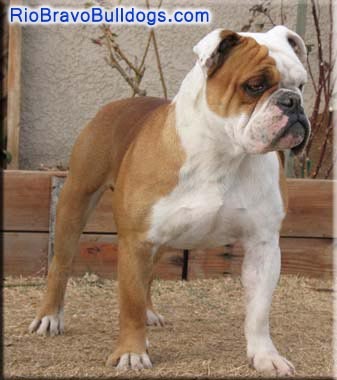 Bam Bam was called this term due to his history of producing phenomenal Olde English Bulldogges regardless of which bloodline he was bred to. 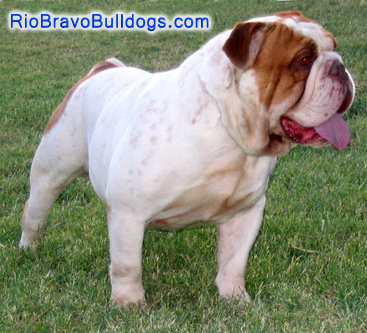 Bam Bam's genetics are alive and well here at Rio Bravo Bulldogges. We currently own two daughters and numerous grandchildren of Bam Bam's. 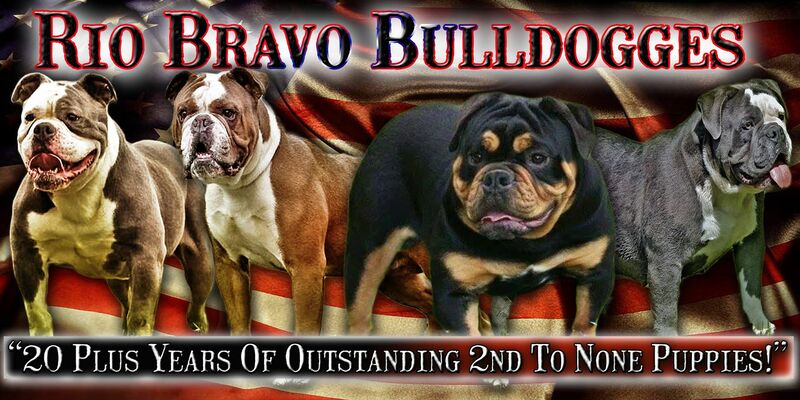 Our two females Rio Bravo's Jada and Rio Bravo's Rosey Dosey are both direct daughters of Bam Bam. Rio Bravo's Ima Deuce Z is a granddaughter and Rio Bravo's Jane Deere is a great granddaughter of Bam Bam's.